Even the trucks are used in mining operations, it is a sign of the future for logging equipment. More than 100 AHS trucks operate in Australia, North and South America. Based on the now tested record of safety, productivity, environmental resistance and system flexibility in an array of mining environments, Komatsu plans to accelerate the pace of AHS deployment. In 2005, Komatsu began the AHS trial at CODELCO’s copper mine in Chile and succeeded in achieving the world’s first commercial AHS deployment with Codelco in January 2008. 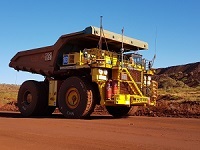 A second successful deployment followed in late 2008 at Rio Tinto’s iron ore mine in Australia and Rio Tinto currently operates AHS trucks in four mines in the Pilbara region of Western Australia. The entire AHS operation is controlled remotely and efficiently from Rio Tinto’s operations center in Perth, roughly 1,500 km (930 mi) from the mines. Following those successes of AHS deployments, Komatsu supported Suncor’s pilot of AHS in a section of their oil sands mine in Canada in 2013. Today, the AHS operates around the clock, hauling three different commodities, in six mines across three continents. By the end of 2017, the AHS recorded a world-leading, cumulative total of 1.5 billion tons of hauled materials. In the area of safety, AHS is significantly safer than in conventional mining environments where even a small truck driving error could cause a serious accident. AHS enabled customer productivity has improved, reducing load and haul unit costs by more than 15%, compared to conventional haulage methods. In addition, the optimized automatic controls of the AHS reduce sudden acceleration and abrupt steering resulting in 40% improvement in tire life compared to conventional operations. To extend the proven AHS benefits to operations with manned haul fleets, Komatsu conducted and successfully completed trials of its AHS retrofit kit at Rio Tinto’s existing mine in September 2017. The retrofit kit, mounted on a Komatsu electric drive standard truck 830E (nominal payload: 220 tons), enabled the truck to operate in autonomous mode. As a result, Komatsu recently received an order from Rio Tinto for 29 AHS retrofit kits, to be installed on 830E standard trucks currently operating at Rio Tinto’s Brockman 4 mine.